My brother & Dad recently came back from a 2 week trip to Ghana. For my Dad it was a place he had last worked & lived in 40 years ago. For my brother it was a chance to visit his new friend Wazi & to see Africa for the first time. See their photos here on flickr. In December ‘06 my friend Darren began working for an NGO in Tamale (city in northern Ghana). For him it is a life changing experience. 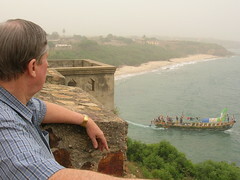 See his photos of Ghana here on flickr. All of their stories are for me more reason why I need to travel much more.